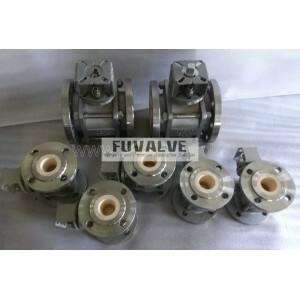 FUVALVE ceramic ball valves ,controlled by electric powers (220V or 380V or 110V), have been widely used in all kinds of extreme corrosive and abrasive applications,such as Silicon Powder,Alumina Powder,Dry Coal Powder,Limestone Slurry,Gypsum Slurry,Plaster,Fly Ash,Mining Ore,Coal Powder Injection,Metallurgical dust,Thermal Power plant FGD lime slurry,Petroleum Solid Catalyst pneumatic conveying system ,TiO2 suspension with sulfuric acid,Ammonia solution with powder,Hydrochloric Acid,Liquid Chlorine. The valve ball, valve seat and inner lining are all made of Hi-performance structural ceramics with hardness of HRA87 or above. So structural ceramic ball valves can withstand the impact of Hi-speed liquids and hard grains, displaying excellent performance on wear and corrosion resistance. The valve ball, valve seat and the inner lining are all made of Hi-performance structural ceramics. They have been examined by the Metal Research Institute of Chinese Academy of Sciences, showing that the structural ceramics have excellent corrosion-resistance, except to glass-liquor and hydrofluoric acid. The static pressure test showed no leakage after 10000 times opening-closing. Structural ceramic ball valves are applicable to various acid, alkaline or saline solutions, gaseous media, etc. Hard sealing ball valves can also be used in media with particles and fibers.